SSC (Staff Selection Commission) has Declared final Result of Sub Inspector in Delhi Police , CAPF and ASI in CISF Examination 2016. 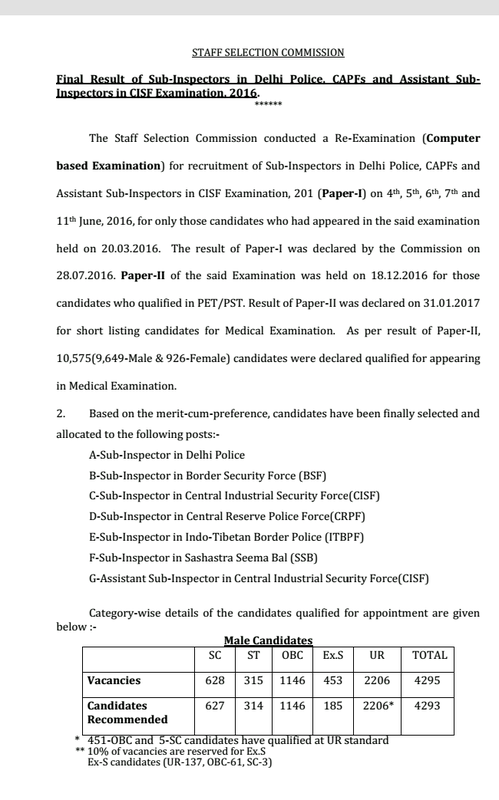 Final Result of Sub-Inspectors in Delhi Police, CAPFs and Assistant SubInspectors in CISF Examination, 2016. 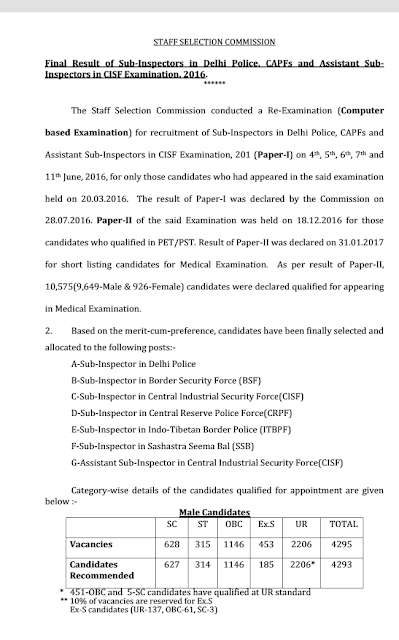 Assistant Sub-Inspectors in CISF Examination, 201 (Paper-I) on 4th, 5th, 6th, 7th and 11th June, 2016, for only those candidates who had appeared in the said examination held on 20.03.2016. The result of Paper-I was declared by the Commission on 28.07.2016. Paper-II of the said Examination was held on 18.12.2016 for those candidates who qualified in PET/PST. Result of Paper-II was declared on 31.01.2017 for short listing candidates for Medical Examination. As per result of Paper-II, 10,575(9,649-Male & 926-Female) candidates were declared qualified for appearing in Medical Examination.